Masala bhath or Masala bath is a very simple and mild rice variety made in the state of Maharashtra. It is as pulihora to Andhra people, Masala bhath to Maharashtra people. I heard about it in my family circles who live in Maharashtra. One of my cousin learn from them and introduced it to us. We liked it very much. 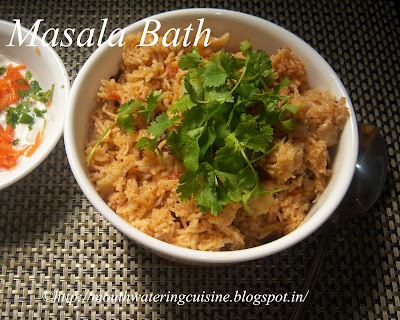 The dish is very simple and mild in taste, it is neither too spicy nor too bland. Even kids also liked it very much. 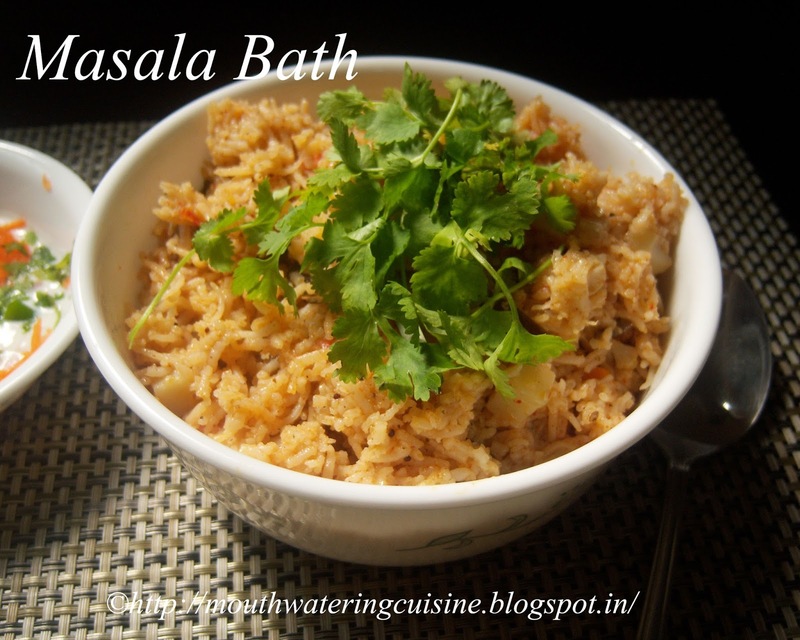 My cousin told that it can be made with our regular rice or with basmati rice. But I tried it with basmati rice only. The rice cooked perfectly and all the grains separated. All the spices mixed with the veggies and rice evenly. I kept the left over bath for the next day had it to my full satisfaction. Enjoyed it so much I could not stop telling everyone about it and praising the taste of Maharashtra. Cut all the veggies into small cubes. Heat oil in a thick and deep bottomed pan. Add mustard seeds and bay leaf. When they start spluttering add onions. Fry onions till they turn translucent. Add all the other veggies. Fry them for a while or till they become soft. Add turmeric powder and red chilli powder. Mix them well. Add goda masala and stir well. Drain excess water from rice and add it to the veggies. Fry for a while. Add water and salt. Mix well and cover the pan. I cooked it in the pressure cooker, so let it cooked for three whistles. Once done allow the cooker to cool down completely and open the lid. Add ghee to it and again mix it properly. Top it with chopped coriander leaves. My people do not like coriander leaves, so I have added very little. Serve hot masala bhath with onion curd raita.